Are you brave enough to take on the howling wolf? This 5 reel, 25 payline online slot games beauty is set ahead of the backdrop of a creepy haunted castle filled with bats and other scary creatures. Overcome your fears when you encounter the Dracula, Witch, and Frankenstein symbols throughout this online game to win endless free spins and cash rewards. Eyecon pride themselves on diversity: they’ve got a slot game perfect for every player, no matter their interests and preferences. Their key to success stands in simplicity, quality and creativity, all of these adding up to construct fun and financially satisfying slot experiences that bring players back to their games again and again, and a brand we love here on Easy Slots online casino. 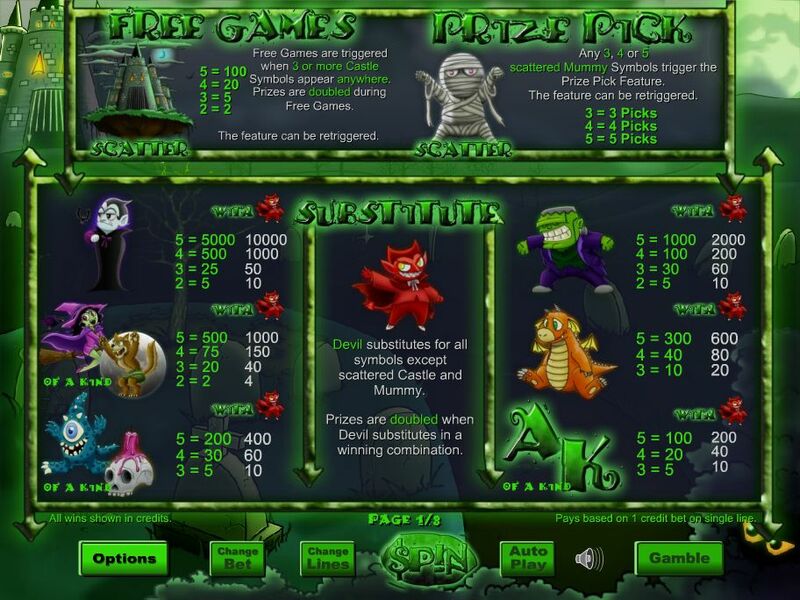 Quite the same, you won’t be able to let go of the Howling Fun slot game, packed with spookiness and supernatural characters that will make you feel like every day is Halloween, only the treats are big wins! Are you ready for a bit of a scare? Under the full moon, when night creatures come to play and creep in your dreams, sending chills down your back, that’s when you’ll find yourself playing this unique slot game that will make your heart race. Don’t worry, though, these monsters bring wins with them, and you’ll wish every night started like this. Better than a horror movie, right? Here Halloween fans come to play all year round and collect their treats, on this sinister and exhilarating slots experience. Howling Fun brings together scary characters like werewolves, witches, mummies, vampires and even the devil, all in 5 reels and 25 paylines of rewarding spookiness. Take a stroll among tombstones and around haunted castles to meet the monsters you’ve been looking for. They’ve been looking for you too and, despite appearances, they’re eager to see you win. Choose the bet you desire from £0.01, £0.02, £0.03, £0.04, £0.05, £0.06, £0.08, £0.10, £0.15, £0.20, £0.25, £0.30, £0.40, £0.50, £1 or £2. Then pick the number of lines you’re playing, from 1 to 25, and let the Howling Fun begin. Slimy letters, a pair of haunting eyes lurking in the shadows, and a foggy background accompany your slot experience, all of it veiled in a green mist. All you will need is the courage to follow the path to the frighteningly intriguing castle. If you’re ready for big wins, you must also be ready to make a pact with the Devil- literally. 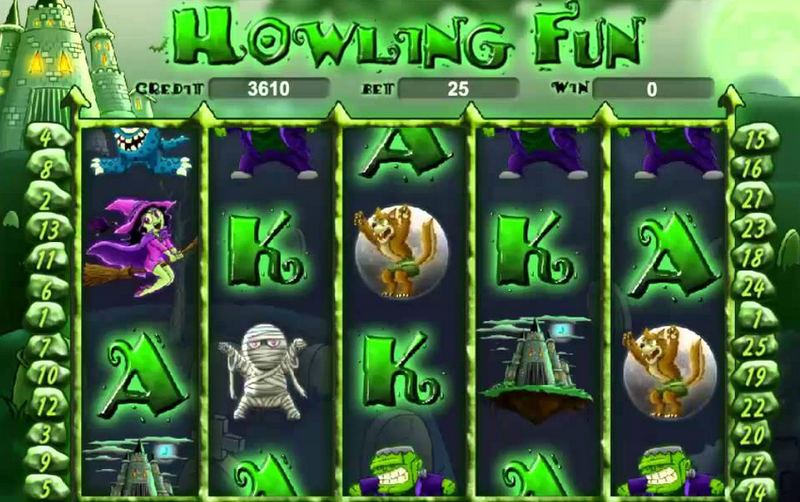 The Devil is the wild card in Howling Fun slot, taking the place of every other symbol on reels 2 and 4, except the Castle and the Mummy, creating winning combinations. He’s generous too, he’ll even double your wins! Speaking of Castles and Mummies, these spooky and old apparitions represent the Scatter symbols. The gothic building activates the Free Games feature when 3, 4 or 5 of them appear anywhere on the reel, giving you 15, 20 or 25 free spins. Not so scary anymore, right? Mummies bring you prizes from ancient Egypt, but be careful so they’re not cursed! With 3 or more mummy Scatters on the wheel, you activate the Prize Pick Bonus and if you’re lucky, you could win a Multiplier of up to 100x! That is, if the monsters allow it. Don’t worry, you might just befriend them. On this 25 payline, 5-reel slot game, you’ll come face to face with the monsters of your childhood and you’ll come out victorious. Don’t miss the spooky excitement that only Howling Fun can bring! 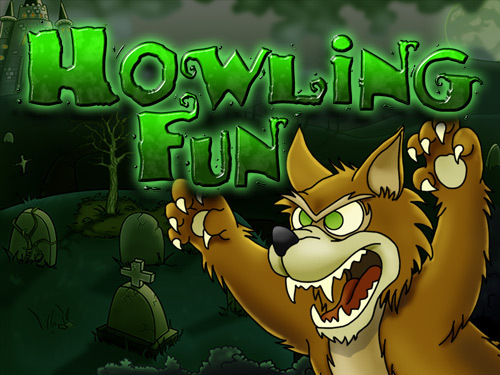 Howling Fun is the dream slot game of every fan of creepy characters and legends or more simply, of Halloween. If you think one day is not enough to properly celebrate this holiday, this is the perfect game for you.